The city of Agra is world famous for the Taj Mahal and millions of tourists from all over the world come here every year to savor the different moods of this magnificent edifice. As Agra was the seat of the great Mughal rulers for many years, it also has a number of historical monuments in and around the city, dating back to the 16th and 17th century. Agra is located in the state of Uttar Pradesh. It is situated on the west bank of river the Yamuna. Agra is 204 km south of Delhi. 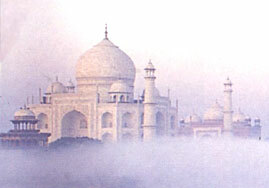 The climate of Agra is extreme and tropical. Summers are extremely hot and the maximum temperature can be as high as 45 degree Celsius, while winters are cold and foggy. Heavy rains and high humidity mark the monsoon season. Agra has a rich historical background, which is amply evident from the numerous historical monuments in and around the city. Agra was founded by Sikandar Lodhi (Lodhi dynasty; Delhi Sultanate) in the 16th century. Babur (founder of the Mughal dynasty) also stayed for sometime in Agra. Emperor Akbar built the Agra fort; Jahangir beautified it with palaces and gardens. Shahjahan marked the zenith of Mughal architecture, when he built the Taj. There is no other monument in the world, which can match the beauty and grandeur of the Taj Mahal. Set amongst the serene ambience of a well laid out garden the massive marble structure of the Taj is awe-inspiring. The Taj Mahal was built in the 17th century by Shahjahan- the fifth Mughal emperor, in memory of his beloved wife, Mumtaz Mahal. It is more than 350 years since Taj Mahal was built, but it has not lost its romantic aura, which attracts millions of visitors towards it. Agra might be world famous for the Taj Mahal, built by the Mughal emperor Shahjahan in memory of his beloved wife. However, it is also famous for the Agra Fort, which is a veritable treasure trove of the Mughal architectural tradition. The various buildings within this sprawling fort complex represent the assimilation of different cultures, which was the mark of the Mughal period. Itmad-ud-Daulahs tomb is a highly ornate edifice, which is looked upon as an imminent precursor of the Taj Mahal as far as elaborate carvings and inlay work are concerned. The tomb marks a significant departure from the tombs of the Mughal dynasty built before its construction. Situated at a distance of 55 km from the city of Taj Mahal, Agra, Bharatpur hosts a variety of bird species from across the globe. Close to 380 species of birds are found in this 29 sq km stretch, approximately 10 sq km of which comprises of marshes and bogs. How does one describe Delhi? The capital city of India? The capital of the worlds largest democracy? Actually, Delhi is India in miniature. Over the millennia, it has wooed rulers, attracted plunderers, and tried historians with so many details. Agra, situated at a distance of around 204 km from Delhi, always remained in struggle to be the centre of power with the later. The city of Gwalior, the city of famed Scindia's and known for it's mighty fort is located at a distance of around 118 km from Agra. Mathura (or Brajbhoomi) is famous as the birthplace of Lord Krishna, an important deity in the Hindu religious pantheon. It is an important pilgrim place of the Hindus and one of the seven sacred cities in India. The main pilgrim center in Mathura is the Shri Krishna Janmabhoomi temple. Mathura is located at a distance of around 47 km from Agra. Akbars tomb at Sikandra is an excellent example of assimilation of different styles of architecture and it represents a significant departure from the earlier Mughal buildings. Agra city is known for its Taj Mahotsav (Taj Festival). This cultural festival is held every year in the month of February. The Taj Mahotsav brings traditional Indian music and dance on a single platform for the tourist to relish. Agra has both traditional and modern shopping areas. It is known for leather products, jewelry, rug weaving and marble work. The Sadar Bazaar area and the area south of Taj Ganj, boasts of many emporia and shops. Shilpgram or crafts village is located 1 km from the eastern side of the Taj, from where one can buy good quality craft items. Agra airport is 7 km from the city center and 3 km from Idgah bus stand. Indian airlines operates daily tourist shuttle flights to Agra, Khajuraho, Varanasi and back. It takes more than 2 hours from Delhi to Agra by train (Shatabdi Express) and more than 4 hours by road. The main railway station is the Agra Cantonment station.